Is Red n Tacky Really Good to Use in Our Trains? ?...Maybe Not. After doing some Internet searching. Red n Tacky is an EP (extreme pressure) grease with a "high level of EP additives". These EP additives contain sulphur which will attack brass and bronze components. Normally bushings don't get greased. If a train maker is worth its salt the bushings should be sintered bronze impregnated with oil. Oilite developed these. Grease clogs the pores so the oil doesn't do its job. If you add any lubricate make it light oil only. Save the grease for the gears. Normally bushings don't get greased. If a train maker is worth its salt the bushings should be sintered bronze impregnated with oil. This is Lionels newer gearbox design. 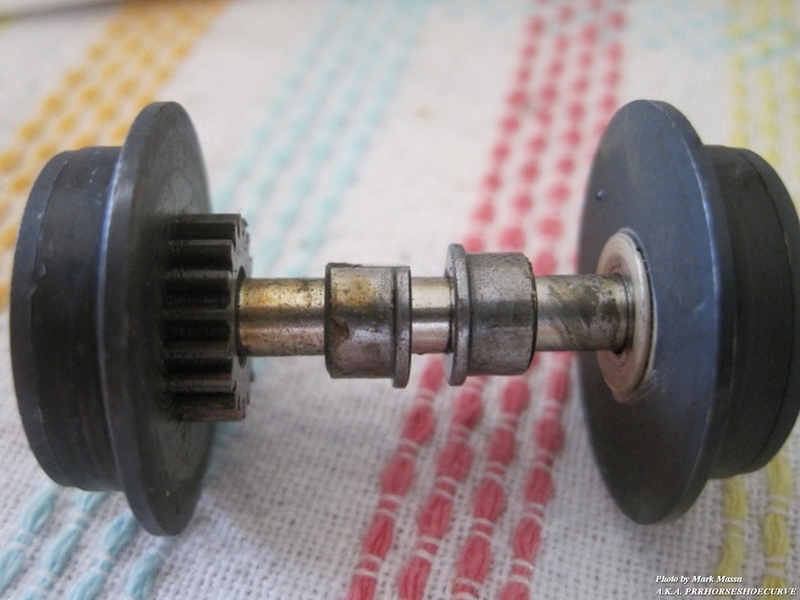 Theres an intermediate gear between the worm and the axle gear. This intermediate gear rides on a shaft that spins in bushings on either side of the gearbox. Grease that finds its way up to the worm eventually migrates to one end of the shaft with the pitch of the gears. This end of the shaft also seems to get the brunt of the torque from the gear pitch as well. I have no way of knowing if the bushings are bronze or brass, they appear to be brass, more "orangy" in color?. Sound advice from above comment. When my Oilite bushings need servicing(premier axles have several) i clean with CRC electroclean and then lube with 0w 20 mobil one. If additives in Red n Tacky do attack bronze, then I wouldn't use it in a model train. What was it originally marketed for, what kind of materials? So many of my locos have nylon gears, I've been using Labelle 106 & 107 for years. Also Mobil 1 5W30 synthetic for oil, and occasionally Lubriplate or the gooey black Molybdenum (moly) grease on old-school postwar with all-metal gears. Hmmmmm..I can't remember ever putting any type of grease on any of my gears, but I do use that Red n Tacky on all my farm tractors/implements and it does help when using a new chain on a chain saw. However, do remember all the excitement years past when one of the forumites suggested using RNT. I have been using Red and Tacky but it seems too thin and seems to disappear after use. In the really old days many used Lubriplate, a white grease. It stayed on the gears better but dried out after a year or two. White greases used in boat trailer axles may be a good alternative but stay away if it has lithium. I recently spotted some noticeable bushing wear on the upper shaft of one of my older legacy locos. I hope Red N Tacky isn't doing as much harm as it is good. Experts please tell me this doesn't apply. Every loco I have has Red n Tacky in the gearbox. Unfortunately I think you have the answer in your research. Well, now something else to worry about (aside from zinc rot/pest). However, I have not used Red 'n Tacky in my engines but I have used MTH grease, which is the same color and consistency! With my last addition to my little fleet, the VL Niagara, I used a Labelle teflon grease on the main drive gear after reading about it here. I just use regular ol lithium grease in a mini grease gun with a needle applicator. Never used Red n Tacky. I've been using Labelle 106 and 107 for years. It's made for this purpose and doesn't harm any of the materials used for gears or bushings in our trains. A tube of each lasts for years. Why spend $$$$ on trains and then get cheap and repurpose automotive grease? Use the proper product for the proper purpose. Right now, they are offering free shipping. I remember seeing this a few years back. I briefly considered switching lubricants, but then I considered that this test is conducted at 100 degrees Celsius - the boiling point of water. I don't know about you, but I can't remember picking up up a loco and finding the gearbox hot to the touch, let alone boiling. Granted, I don't run them for hours at a time. Anyway, I would be surprised to see corrosion in my lifetime - the conditions we use our trains under are child's play compared to what this product is designed for. I have not been able to locate ASTM D130 copper strip corrosion test results for Red 'n' Tacky. At the time, I considered switching to Super Lube, which scored very well (1b) on that test, but I didn't like that it contained PTFE (Teflon). If high pressure additives in Red 'n' Tacky can possibly seep into oilite bearings and plug them, PTFE is far worse. In fact, Super Lube's literature says that the PFTE is designed to come out of solution and coat the gears... I didn't want that stuff near bearings. If they have a no-teflon product, I might yet switch to that...but I already have a whole tube of RnT And I'm just not convinced it's that big a problem. So I've stuck with Red 'n' Tacky. It stays where I put it. It doesn't harden. And everything I use it on runs like silk. What’s the problem with lithium lubricants and/or Teflon (I believe Labelle grease contains Teflon). Some other members posting to this thread are recommending them. High adhesion grease is meant to be used on stuff like weather exposed front end ball joints that are slow moving but experience extreme pressure. 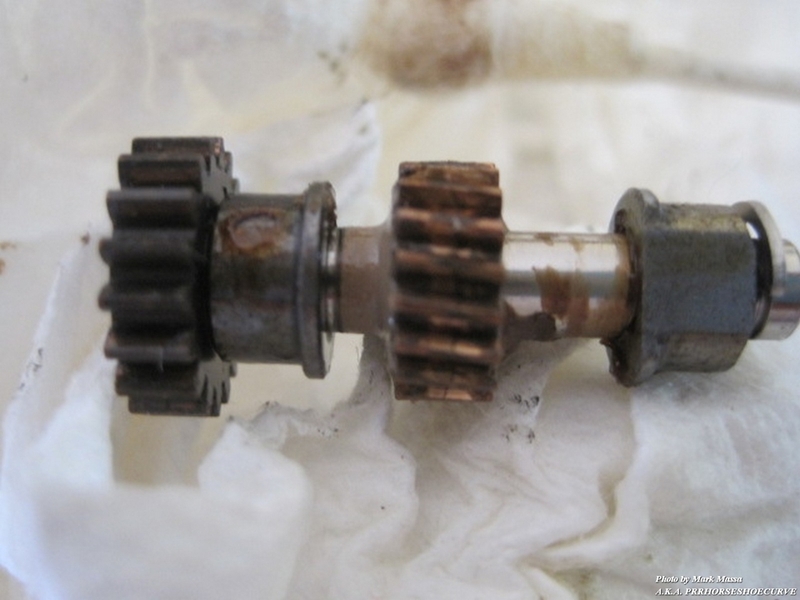 The problem with it if packed into a gear box through the lubrication access hole, with higher RPM moving parts inside, is friction heat build up. It's not meant to be used in that type of environment. For those who do like it cause it sticks to the spinning worm gear well, I would remove the cover from the gear box, clean out all the original grease, then only apply it to the worm gear itself, leaving the box empty to help keep things cooler. As for myself, I like synthetic low friction grease in squeeze tubes. One caution though with synthetics, it's a bad thing to mix it with standard greases. It becomes acidic if mixed. Very important to clean out the old grease, before using, then add a small sticker to the bottom of the engine that says SYN LUBE. 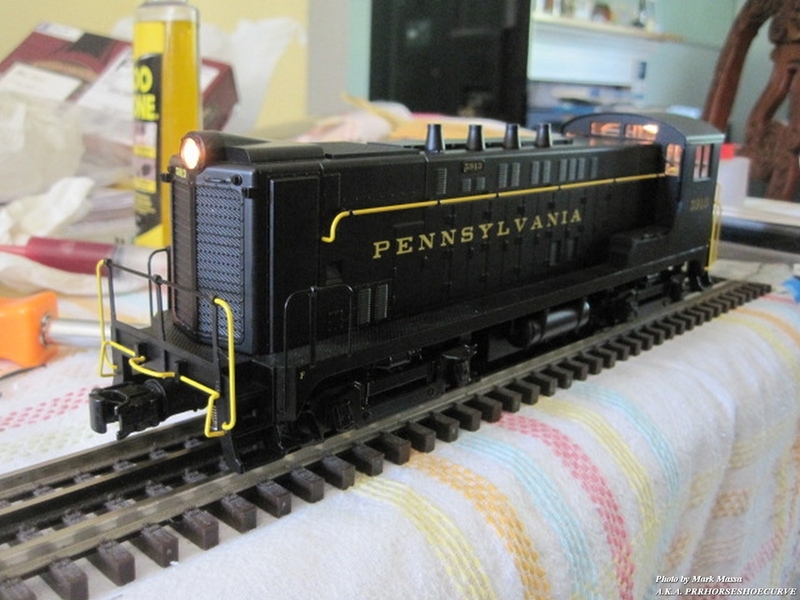 Bill, I have an MTH standard gauge tin plate Blue Comet that black moly was used in. MAN DOES IT STINK. I really need to get that stuff replaced. I think China got it from the bottom of a swamp. Well, the classic white lithium grease would dry out and get hard as a rock. Even the stuff that comes in '80 and '90s Lionel from the factory has the same problem. It gets down into the grooves on the worm shaft and solidifies. Anything I buy from that era gets de-greased and de-crusted before I even apply power. With Teflon (PTFE) the problem is pore clogging. Some trains use bearings made of Oilite, a porous bronze which is charged with oil at the factory, and slowly released it over time. Basically, they are self- lubricating. But if grease gets soft and migrates down the gear shaft to the bearings it can get into the microscopic pores and stop migration of oil out of the bearing. This is something of a worry with the EP additives in Red 'n' Tacky, but Teflon grease is apparently actually designed to do this. Obviously, they don't intend for you to use it on bearings! But sometimes gears and bearings are in close proximity, so I feel better skipping the Teflon. High adhesion grease is meant to be used on stuff like weather exposed front end ball joints that are slow moving but experience extreme pressure. The problem with it if packed into a gear box through the lubrication access hole, with higher RPM moving parts inside, is friction heat build up. It's not meant to be used in that type of environment. 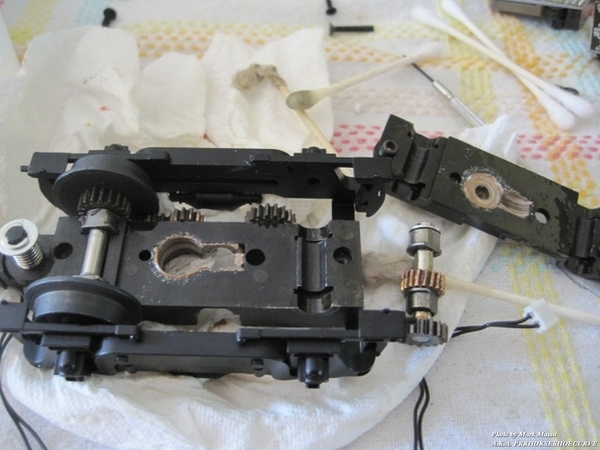 For those who do like it cause it sticks to the spinning worm gear well, I would remove the cover from the gear box, clean out all the original grease, then only apply it to the worm gear itself, leaving the box empty to help keep things cooler. This. Since so many engines, especially old ones, do not have enclosed gear boxes, Red 'n' Tacky is ideal for exactly these reasons: think of all those steam engines with exposed gears, or all those diesels with the late-postwar / MPC type motor trucks. Or even the little idler gears hiding under the truck side frames on newer diesels. On my few engines that are built with enclosed gear boxes, the above is just what I do: put the grease where it needs to be and nowhere else. NICKAIX, I agree with you 100%. I have never witnessed a gearbox that the grease didn't migrate down into the lower bushing. The upper bushing toward the motor seems to stay dryer. That's why I never fill the gear box and limit the grease to just the worm gear. That will keep it from squeezing out through the bushings. After reading through all the responses, I had to chuckle for a moment as I recalled this repair on the front truck of a 200 series ALCO. Bushings??? We don't need no steenking bushings! Lionel's design was to let the axles (and therefore the weight of the car) ride on the edges of this piece of sheet metal - and that was the ONLY bearing surface! Thank goodness this era has passed!!! I have been using Red N Tacky #2 for a while now on some of my steam engines, (Several MPC Berks, The Commodore Vanderbilt) etc. No issues to report and the engines with the AC motor run really smooth!!! No Gear Grinding noises either. I bought a NOS 6-18130 Santa Fe F3 AB set from 1996 this year. I disassembled it and cleaned the old grease (it was white and smelled awful) out of the trucks and replaced it with Labelle 106 grease on the worm, pinion, and wheel gears and put Labelle 107 oil on the axle bearings. 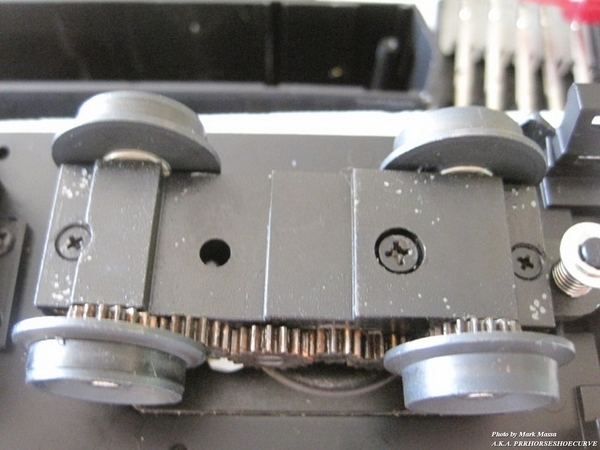 I disassembled both "Pullmor" motors and found that either Lionel didn't grease the thrust bearings (the ball bearings in cages) or the grease had dried out. Either way I put some Labelle 106 on each bearing set in both motors and oiled the top of the armature with Labelle 107. It is the quietest "Pullmor" motored locomotive I own. I can barely hear the motors running. How much grease are people applying that they automotive size tubs of grease? It takes me about 4-5 years to go through a tube of Labelle 106 grease for my 8 locomotive fleet, and that's running trains 3-4 hours a week. I'm on the same tube of Labelle 107 oil I bought 8 years ago. Lou - a couple of comments, the first being I think that sometimes the only package available for certain types of grease, at certain stores, might be a whole tube for a grease gun - I don't think they are really using that much grease, or at least I hope they aren't! Secondly - congrats on scoring such a nice engine! I would LOVE to have a Pullmor that is as quiet as yours! I've only got one or two in my mostly PW collection that are even close to being quiet, and they also employ real ball bearings instead of brass/bronze/oilite sleeves. In addition to my day job, I also farm. We use red'n'tacky as well as some other EP grease lubricants from a well known agriculture equipment manufacture that happens to paint there equipment green. We like the red'n'tacky when as it does a good job a staying where you put it. When it comes to brass and other yellow metals, you only really run into problems if those metals get hot under operation. A good example is a small gearbox used for one of our grain sample unloading augers. It has an exposed worm worm gear, no oil bath, so grease is the only option. The worm gear is brass, and we've been using red'n'tacky for as long as it has existed and haven't noticed any corrosion of the metal. This auger is was built sometime in the 50's and is still running quite well today. With red'n'tacky the grease stays put, and we were able to reduce the lubrication intervals for this gear box. In this particular situation the red'n'tacky also resists water, and other foreign chemicals better than what we using before. We were told it is okay to use EP lubricants with higher levels of additives because this gearbox doesn't reach temperatures over 200 degrees. At higher temperatures, the EP additives will begin to react with yellow metals. I would think that much grease would separate after having it for years. After all it would take the typical hobbiest decades to go through an entire tube of grease. The F3s I bought have the modern version of the 2028-100 motor. I have found this motor (and the similar one used in the FMs, GG1s, and early NW2s/Alcos) to be the best running "Pullmor" motor. Grease the caged ball bearings in the thrust washers and they run pretty quiet and smooth. About the same as a can motored diesel without cruise control (i.e. PS1 MTH Premier). I've been using Red N' Tacky for years now and just about about every post-war engine I have with a gear box has the worm wheel well coated with the stuff. I have not had any problems as of yet but if the original posting is accurate I've got a lot of work on my hands. I've been using Labelle 106 and 107 for years.. A tube of each lasts for years. I totally agree. Labelle makes my engines run smooth as silk. Also very quiet. It’s purpose built for model trains. Just because elemental sulfur is listed as present in RedN'Tacky does not necessarily mean is in a form harmful to brass. I have been using R&T for many many years, never a problem on any of my Trains, the gears are unaffected and everything runs perfectly. Charlie is correct it does not necessarily mean the sulfur element is in a harmful form if you see it listed. Way to many people use it, if it degraded the Brass & gears we would have seen the effect long ago. I have yet to see any harm that Red and Tacky (R&T) has caused to any locomotive applied. I used R&T on my Weaver VO1000 when the O.E.M. grease jammed the gearing from the get go! I never have an issue when running it lately. I think the o.p. is reading too much into it. The proof is in the pudding. Show me a damaged loco from applications of R&T. Until then, I am using it. It's cheap, readily available, affordable and as others said the grease clings to the gears instead of dripping off when some heat is present. I think there are enough positives here so I would not worry about it anymore. Can’t seem to find this on the web, just an aerosol spray spray lube with lithium, is that what you use? Do you have more details like sku #, where to buy, or a photo of the can? Lately, I’ve been using 90 weight gear oil rather than grease (Labelle used to sell this). Grease just seems to squish out from between the gears and then harden where it does no good. I have also used Labelle’s actual grease (forgot the sku#) with seemingly satisfactory results, though it does have Teflon. For cleaning old dried up grease, I use Ronsonol or Zippo cigarette lighter fluid (aka naphtha), which works very well, just keep it away from sparks or flame! I think the point is being missed here. The question is whether or not RnT and it’s sulfur additives are causing chemical/corrosion damage to bronze or brass components in typical model train applications. Whether or not it works well in your chainsaw, farm tractor, or semi-truck u-joints is pretty much irrelevant unless those items are made of brass. The negative effects of sulfur on copper, a major component of brass and bronze are well documented. And I as I reported earlier, Using RNT on a 70 year old solid brass worm gear (which has had much more use than any toy train on the planet), for the last 25 years (or whenever RNT first became available) has yet to see any ill effects on that solid brass worm gear. You need (significant) heat for RNT to really start doing some harm on yellow metals. We had our reservations at first also but after discussing the application for which RNT was being used, we were assured the grease wouldn't be an issue. 25 years or so later, "the proof is in the pudding". Interesting discussion. I bought a tube of RNT yesterday and will soon try it on a dual motor AF diesel with axles bushings, metal worms, and plastic/nylon drive gears. 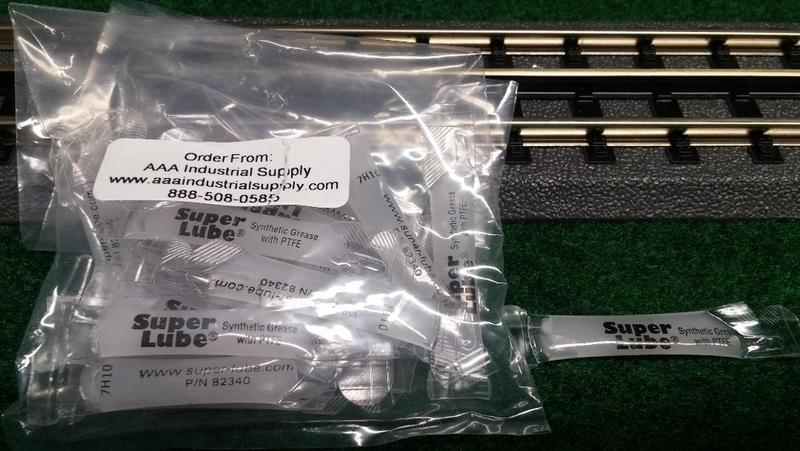 I've been using Lubriplate 630-AA for a long time with great success on my engines and those I repaired for customers. Prior to that I tried LaBelle 106 with Teflon, but found years later it had dried out , stiffened, and changed from slick and creamy to a more putty like consistency. I actually had to remove it on some and replace it with 630-AA. For oils, I prefer plastic compatible LaBelle 107 medium and 108 light. Great and lasting success with them. PS Any chance RNT is the grease (#14-25 Special Racing Oil) that was sold years ago for use with Aurora HO slot cars? It came in a small glass jar like a Testor's paint jar with an applicator. When I opened up my tube of RNT yesterday and put some in a syringe, its consistency and mild odor reminded me of that. Talk about throwbacks.